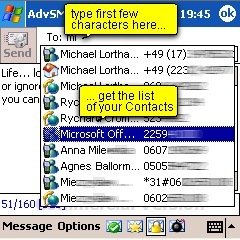 The SMS messages sending, time scheduling, encrypting... and more. Secure your personal minds! Now! and send away on pre-defined future moment. with just an one touching of screen. You will be alerted by sound, vibration or voice, about the number of received messages, every minute until you read. Do you understand: all your ordinary plain SMS messages are transparent (visible) for network operator's staff, hackers, and many more people interest in your minds and life (you even know). 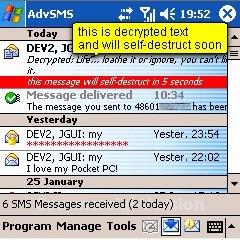 when Recipient decrypt and read your message, then it will self-destruct after 5 seconds, absolutely! * Encryption features and self-destructing are available only between devices with this program on both sides. 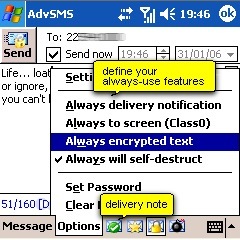 The interface of A.SMS is a replacement of your default Messaging interface. You don't have to learn much more! the default Messaging any more. This program works with any Pocket PC® or Windows Mobile® Phone Edition devices. With any screen orientation or size. Square screens are running already. For more screenshots and some deeper descriptions: click here. There are many screenshots and explains (wait till the whole page will download). You can use it free for any personal needs. no self-destruct messages, no auto-reply functions. You buy one Licence, you can use this program on every your own devices. Using this version for commercial activities or company business, are restricted. 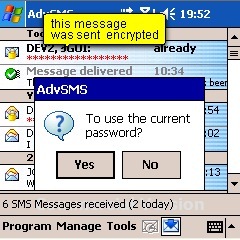 This version has more and stronger encryptions DES, 3DES, DES-2. A fully-operatable Auto-reply with your pre-defined text in specified time delay. You can select any sound file for your message reminder. This version is locked for individual IMSI number of every mobile device. and no matter if this program will open or not. Also, the soft-reset will not decline these messages. you need this program in both mobile devices. your Registration Code you will get with purchasing confirmation email. Corporate Version is locked for individual IMSI number of your SIM card. in case of Corporate Version, before we will send you an individual Registration Code. We're sorry, you have 7 days for free unlimited tests, before you decide to pay. 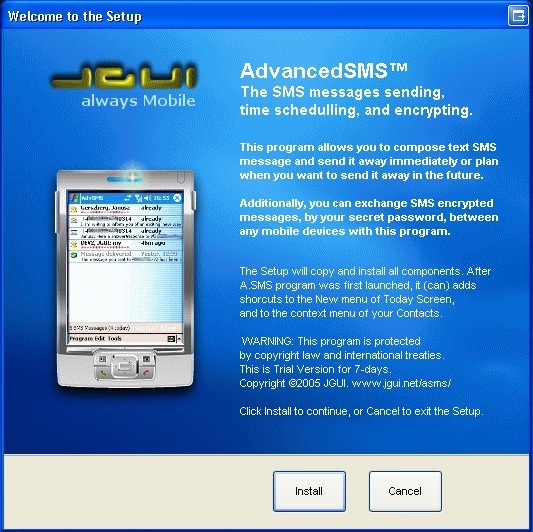 open Settings Remove Programs and select A.SMS to uninstall.